GERMANY (translated by Sonja Grob) Every year during the international five-star tournament in Stuttgart a stallion that had outstanding sport results is decorated. The stallion owners of the German Sport Horses and tournament manager Gotthilf Riexinger elected the Gribaldi-son Unee BB as Master stallion 2015. Jessica von Bredow-Werndl presented her star Unee BB (Gribaldi - Ilarichita x Dageraad) with a short Freestyle program and after that she received the congratulations from the chairman of the German Sporthorse Stallion Owners, Paul Bengesser, the manager of the South German Horse Breeding Association Roland Metz and tournament manager Gotthilf Riexinger. Also attending the tribute was Unee’s owner, the former international judge Beatrice Buerchler-Keller from Switzerland and stallion holder Maria Wadenspanner from Rottenburg. 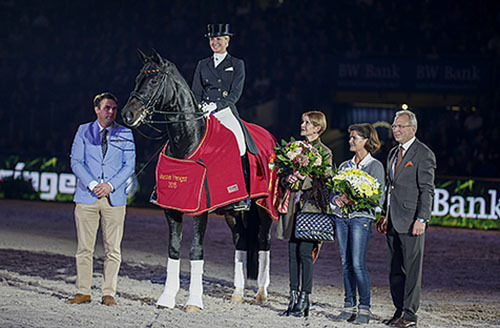 Covered with the Masters blanket the 14- year-old Unee BB and Jessica von Bredow-Werndl went on the lap of honour – celebrated enthusiastically by the audience.